Kals 24 km from Matrei in Osttirol: In winter: join the ski slopes by skiing from the front door! 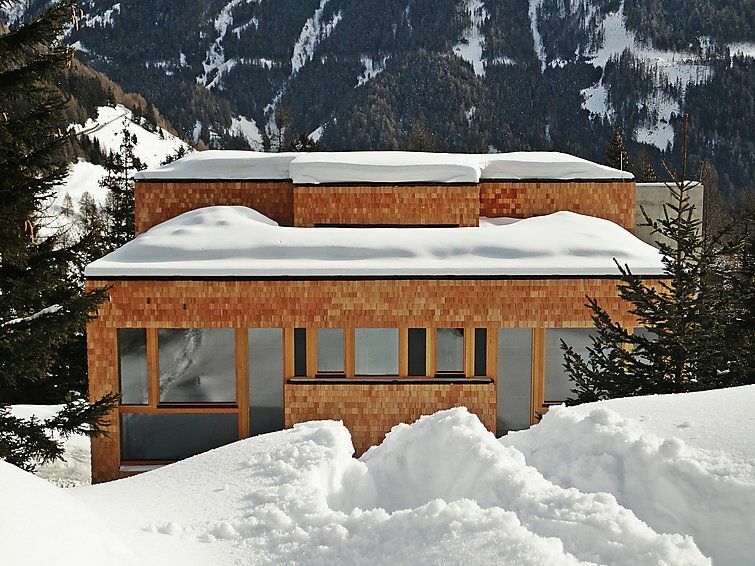 modern, luxurious chalet "this property", 1'500 m a.s.l., built in 2012, surrounded by meadows. 41 houses in the residence. Above Kals, in a quiet, sunny position. For shared use: indoor pool heated. Nat. Swimm. Pond. In the complex: restaurant, breakfast room, sauna, fitness room, steam room, infrared sauna, spa area, playroom, shopping facilities, kiosk, storage room for skis, ski boot dryer, bicycle rental. Breakfast and half board possible. Pre-arrival grocery service. Communal covered parking. Restaurant, café 100 m. Skisport facilities, slopes, ski rental, ski school 100 m. Please note: car-free holiday complex. Your luggage is brought directly to your cottage. Each chalet is accessible in 4 steps. Access to the parking area is included in the price. Additional seats are extra. The access to the chalet is made by paths left in the wild. Open cable car is included in the prices in summer. Nearby: delicatessen, tobacconist, sports shop, hairdresser, climbing wall. Heated swimming pool (800m2) included from 18 May (open only in summer). Wellness treatment on request. Guaranteed location entry from 18:00. Breakfast basket included for the summer of 2017. Half-board: breakfast and dinner. The first dog can be carried free in summer, the second is 10 € / day extra (without food). 3-room chalet 70 m2 on 2 levels. Spacious, modern furnishings: living/dining room with dining nook and tiled stove. Exit to the terrace. 2 double bedrooms, each room with satellite TV (flat screen). Open kitchen (oven, dishwasher, 4 ceramic glass hob hotplates, microwave, electric coffee machine) with dining table. Shower, sep. WC. On the lower ground floor: entrance hall. Luggage room. Beautiful view of the mountains and the countryside. Facilities: washing machine, dryer, safe, hair dryer. Internet (WiFi). Garage on the property. Please note: maximum 2 pets/ dogs allowed. In the small entrance hall you can find an infrared cabin with view over the valley and a storage room for sports equipment with washine machine and dryer. Bundle of wood for the oven and included kitchen kit available on the day of arrival. Espresso machine available.